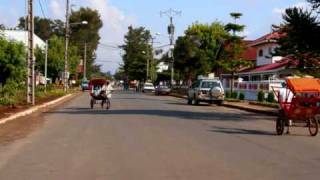 Madagascar with its capital Antananarivo is located in Africa (Southern Africa, island in the Indian Ocean). It covers some 587,042 square kilometers (almost four times the size of Georgia) with 25,054,200 citizens. 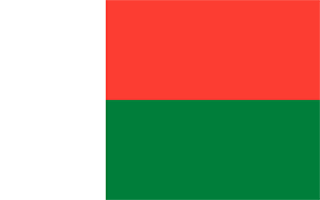 French and Malagasy are the common languages used in Madagascar. Thiscountry has no land-based border with any other country. Madagascar is a country that occupies a large island of the same name, located in the Indian Ocean off the eastern coast of Africa. It is the fourth largest island in the world. Avenue of the Baobabs is an extra-ordinary stand of huge baobab trees. Located 45 minutes north of Morondava on Madagascar's west coast it is one of the most visited sites in the Menabe Region. The eastern, or windward side of the island is home to tropical rainforests, while the western and southern sides, which lie in the rain shadow of the central highlands, are home to tropical dry forests, thorn forests, and deserts and xeric shrublands. The topography is narrow coastal plain, high plateau and mountains in center. The average density of population is about 43 per km². The climate in Madagascar can be described as tropical along coast, temperate inland, arid in south. Potential natural disasters are and locust infestation, drought, Madagascar's volcanoes have not erupted in historical times and periodic cyclones. To reach someone Madagascar dial +261 prior to a number. The local cellular networks are operated on 900 MHz, 1800 MHz, 3G, 4G. Websites typically end with the top level domain ".mg". If you want to bring electric appliances (e.g. battery chaarger), keep in min the local 220 V - 50 Hz (plugs: C, E). The sign for the locally used currency Ariary is MGA. Two equal horizontal bands of red (top) and green with a vertical white band of the same width on hoist side; by tradition, red stands for sovereignty, green for hope, white for purity.